Today we bring you a mod that adds ships. 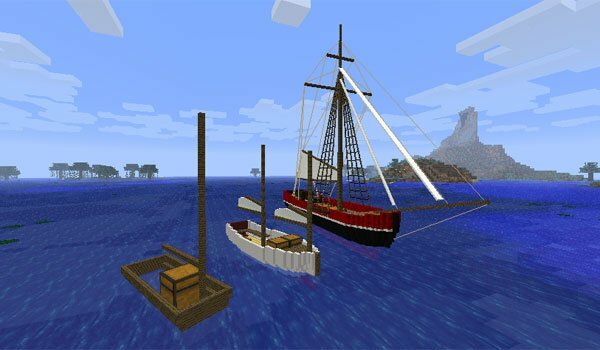 Small Boats 1.7.10 is a modification that lets you craft three types of ships, some predefined ones are quite worked and will allow you to sail the seas of Minecraft with elegance and speed. There are three types of ships to craft, the smallest is the “Elegant Punt”, the medium, called “Whitehall” allows greater transport of materials and people, and finally the “Today” that incorporates large chests and more deck space. These boats have animations, such when turning the boat heels, when the sails move to change direction etc.. We leave you with a video that mix two mods, to see the boats and the contents of this mod, just clic to the minute 8:35. How to install Small Boats Mod for Minecraft 1.7.10? Three types of ships to improve Minecraft boats!